Do you know what all of these books have in common? If you said they were all made into movies, you’re only half right. They have also all been banned at some point since publication. According to the American Library Association, “Banned Books Week highlights the benefits of free and open access to information while drawing attention to the harms of censorship by spotlighting actual or attempted bannings of books across the United States.” This year, Falvey Memorial Library pairs up a selection of banned books with their movie counterparts. Visit the display at the library’s first floor entrance to see a selection of book and movie titles. Does anyone have the right to decide whether you can read a particular book or see a particular movie? 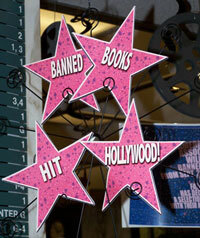 When banned books are made into movies, does the same censorship apply to the movies? If a book is banned or a movie is restricted, does that give a person a greater desire to read the book or see the movie? Does this counteract the intentions of those who instituted the ban or restrictions? Tell us your thoughts in the comments. And check out the books, DVDs and VHS tapes from Falvey’s circulating collections — they’re not banned here! The American Library Association (ALA) celebrated Banned Books Week from Sept. 25 to Oct. 2.